In 2006, Lake Villa and several other northern Lake County, Illinois municipalities were at a crossroads. Over the last decade, the region had experienced substantial growth, and this trend was projected to continue. This population growth was taxing community infrastructures, including the ability to provide adequate, high quality water. The traditional water supply of the area, ground water wells, was determined to be inadequate due to quality and quantity limitations. In response to these concerns, Lake Villa joined other Lake County communities to form “The Northern Lake County Lake Michigan Water Planning Group” (Planning Group). This group initially included Lake Villa, Antioch, Fox Lake, Lindenhurst, Old Mill Creek, Wauconda, and the two Lake County unincorporated areas of Grandwood Park and Fox Lake Hills. Within a year, this group expanded to include Hawthorn Woods, Lake Zurich, Long Grove, and Volo. This group would investigate the feasibility of the communities to utilize Lake Michigan as a water supply source. 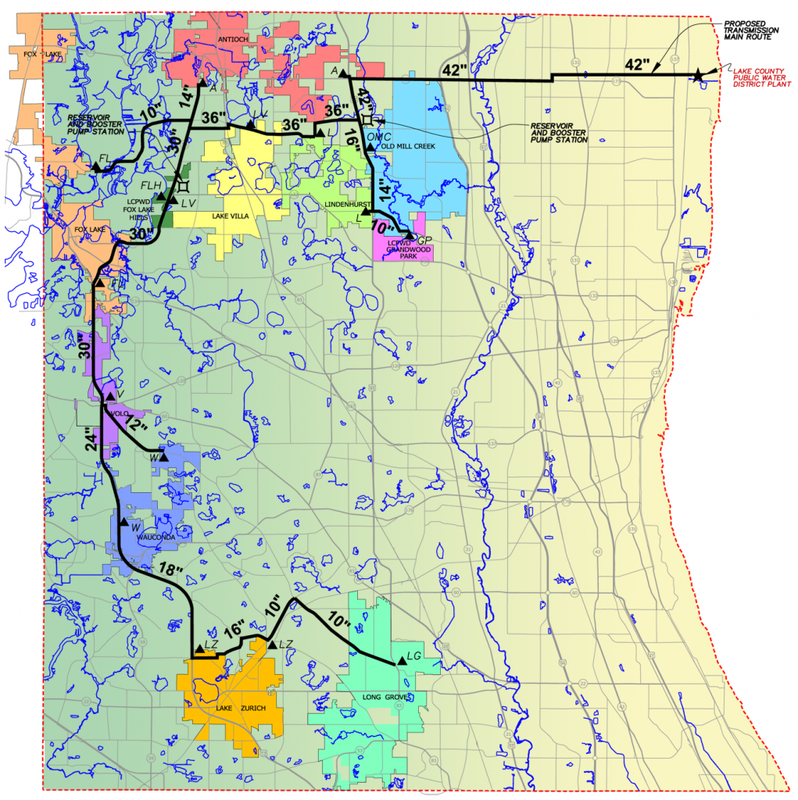 To provide the communities with Lake Michigan water, an initial pipeline route included over 57 miles of water transmission main that stretched from the Lake County Public Water District treatment plant near Zion west to Fox Lake across northern Lake County and then south along the entire western boarder of Lake County. Population and water usage for Lake Villa at the time, the year 2006, was 8,500 with a daily average water demand of 0.72 mgd. In total, the future population projection of the Planning Group is 188,500 with a daily average water demand of 18.61 mgd. The Planning Group completed a Lake Michigan Water Feasibility Study in September 2008. This study concluded that a Lake Michigan water supply system was feasible for all of the original and additional communities. It recommended that the communities pursue a Lake Michigan water allocation through the Illinois Department of Natural Resources (IDNR). Lake Villa and nine other communities completed and submitted Applications for Permit to withdraw Lake Michigan water to the IDNR. The application included historical water usage, present day population and water usage, projected population and proposed water usage, and a cost comparison between a Lake Michigan water supply and a comparable quality ground water supply. In January 2011, after a review process, comments and revisions, and public hearings, the IDNR issued a Lake Michigan Water Allocation Permit to Lake Villa with a 2030 allocation of 1.16 mgd. All ten communities received allocations, but in the end not all of the communities decided to continue with a combined pursuit of Lake Michigan water. Those communities opted instead for other Lake Michigan sources or decided to stop the pursuit for Lake Michigan Water. Lake Villa teamed with three other communities to approach the Central Lake County Joint Action Water Agency with an Admission Agreement effective December 2013. The new pipeline would extend an existing water transmission main by 13 miles. Since the completion of the Route Study, preliminary engineering has started and includes topographic survey, geotechnical investigation, environmental survey, hydraulic and surge analysis and preliminary drawing for the water transmission mains. The scheduled completion of construction for the water transmission main and delivery of Lake Michigan water to Lake Villa is June 2017. Lake Villa has worked for eight years to determine the feasibility of a Lake Michigan Water Supply, acquire a Lake Michigan Water Allocation Permit and a supply source, and determine a pipeline route for a water transmission main. Currently, the Village is completing several internal system improvements, including: connection of the two separate water distribution systems within the Village, construction of 1.5 million gallons of additional ground storage, replacement of older water main, and water main improvements for looping and flow restriction. This entry was posted in Municipal, Water. Bookmark the permalink.